The Pro Force™ debris blower provides greater air volume flow than any single nozzle turbine-type debris blower currently available. A hand-held wireless RF remote control, which provides the capability to start and stop the engine, adjust engine throttle up and down for low to high RPM range of operation, and rotate the nozzle 360 degrees – all from the operator’s seat in a Toro® Workman® MD Series or similar utility vehicle. 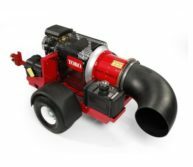 This blower delivers superior productivity and greater efficiency in jobs ranging from cleaning cart paths and other maintained paved areas, to blowing grass clippings, aeration cores or chaff, or other organic debris off fairways or greens. 27 hp (20 kW) Kohler® Command Pro®. Start or stop the engine of the blower for complete operational control. Adjust engine throttle up and down for high to low RPM range of operation. Rotate the nozzle 360 degrees in either direction. Greater air flow to move debris further and finish the job faster. Single piece roto-moulded plastic nozzle is more resistant to damage and is more durable for lower repair costs and less downtime. Two-year or 1,500 hour limited manufacturer’s warranty. Coupled with functionality of wireless remote control, the Kohler® electronic governor allows the operator to have precise engine speed control. Muffler enclosed in protective cage for increased operator safety. Height and length of tow hitch are adjustable to accommodate different towing utility vehicles. Rugged construction, including 1/4` (6 mm) steel frame, provides years of trouble-free service. In independent 3rd party testing, the Pro Force™ demonstrated greater CFM, or air volume flow, than any single nozzle turbine-type debris blower currently available.